Nars Velvet Lip Liner in Costa Smeralda, £18.00, ASOS – When you think about Autumn, you think warm toned browns, oranges and burnt reds. So why not add a pop of colour into your day with a bold lip colour? Nars Velvet Lip Liners sit somewhere between the realms of Matte and Satin, are highly pigmented and long lasting. I already have a few Nars colours and can’t wait to add to them this Autumn. Illamasqua Precision Brow Gel, £18.50, ASOS – My beloved Soap & Glory Brow Archery pencil is coming to the end of it’s time in my makeup bag and my HD Brows palette is no longer wowing me because it doesn’t offer the same precision as a pencil. This gel from Illamasqua looks as though it could fill the gap (pun not intended) perfectly and at that price I’d be happy to give it a go. Steve Madden Casstro Tan Boots, £49.00, Dune – Last winter most of my boots seemed to get to the point of almost no return (although I am going to try and get them repaired because I am that attached to them) so this year I could really use a new pair and these gorgeous Steve Madden’s are just my thing! You can’t beat a pair of slouchy, flat boots as they will team up with anything, they’re like the Cranberry Sauce of the boot world! Barbour International Polarquilt Jacket, £179.99, Barbour – For the past few years I have longed after a Barbour Winter coat but this year a vacancy has opened up in my Winter wardrobe… I just love the design of their jackets because they have all the functionality that you need in a Winter coat but have so many little details making them so stylish and flattering too. Double Sided Checked & Striped Scarf, £19.99, Zara – On the way home from holiday, I picked up the most gorgeous pair of red, Italian leather, driving gloves. 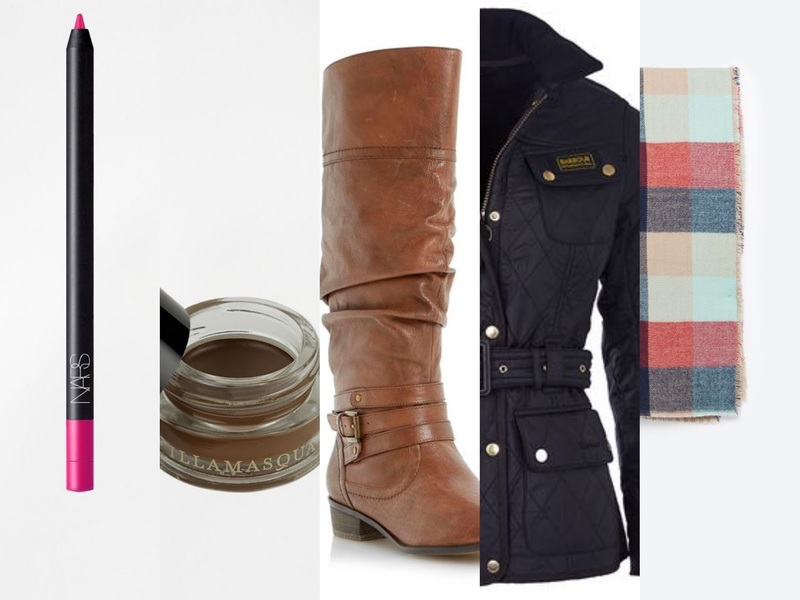 I really want a nice, classic scarf that will go with them perfectly and I do have a soft spot for plaids and checks. This little lovely has caught my eye in Zara and I don’t think I can express how much I want it! All images have been sourced from the linked websites.